Zero clearance wood-burning fireplaces are pre-manufactured fireplaces where the firebox or unit can be almost directly against combustible materials like paneling or wood. This allows the fireplace to fit into a much smaller opening, than most fireplaces. The firebox on zero clearance fireplace is made of materials such that, the outside of the fireplace does not get hot enough to burn other materials. Because you do not have to shield other combustible materials from heat, the installation of a zero-clearance fireplace, is much easier and quicker than a traditional fireplace. Also, it is much cheaper. "48" EPA Traditional Phase II Wood Burning Fireplace- White Stacked"
A zero-clearance fireplace is low maintenance and operation is simple. This beautiful Epa Phase li Wood-Burning Fireplace, created by Superior, will add a touch of modern elegance to your living area. This WRT4820 model is part of Superior's Custom Series. The open-front, traditional design combined with a white smooth clean-face provides a wonderfully neutral option for any home decor. In addition to being a gorgeous fireplace, this model comes with many features, including a black steel door, ceramic glass, decorative log retainers, smooth refractories, an efficient air wash system, and a pre-wired blower. In addition, you'll find a double air combustion control, an outside air kit, and an outside air coupler. Before completing your order, you'll need to choose a Face Kit - either the Louver Kit or the Clean Face kit. Features: Brick Type: White Stacked. Smooth refractory-lined firebox creates a contemporary appearance that exudes style. Single rectangular black door allows for an unobstructed view of the fire. Efficient air wash system keeps the glass clean, reducing the hassle of maintenance. Heat-resistant handle stays cool to the touch. Burn time is approximately 6-8 hours for long-lasting comfort. Specifications: Blower: 200 CFM. Chimney Size: 6". Interior Cubic Feet: 2.0. Maximum Log Size: 19". Heating Capacity (up to): 1,500 sq. ft. Glass Viewing Area: 22.5" (W) x 12.25" (H). Firebox Interior: 22" (W) x 12" (D) x 11.75" (H). Overall Dimensions: 38" (W) x 24" (D) x 36.87" (H). Framing Dimensions: 38.37" (W) x 24.5" (D) x 37" (H). An easy and affordable way to add soothing warm flames to your home. The heavy insulation built into a zero-clearance fireplace saves you money. They are proven to be very efficient. "EPA Traditional Phase II Wood Burning Fireplace- White Stacked"
Decorative cast iron log retainer, Textured refractories, Choice of doors, Efficient air wash system, outside air adaptor, outside air kit, Non-catalytic combustion controlled fireplace, Heat activated blower 200 cfm and Double air combustion control (all in one). Features: Up to 86.6% efficiency and 55,000 BTU heat output. EPA-certified and Washington State-approved 3.7 gr/hr. emissions. Burn time up to 8 hours and heating capacity up to 1,500 sq. ft.*. Heat-activated variable-speed blower for energy efficient heat distribution. Double air combustion control for controlling heat output and wood consumption and for providing air boost control for faster ignition. Gravity vent kits -double duct for heating multiple rooms. Specifications: Blower: 200 CFM. Chimney Size: 6". Interior Cubic Feet: 2.0. Maximum Log Size: 19". Heating Capacity (up to): 1,500 sq. ft. Glass Viewing Area: 22.5" (W) x 12.25" (H). Firebox Interior: 22" (W) x 12" (D) x 11.75" (H). Overall Dimensions: 36.75" (W) x 24.93" (D) x 42.06" (H). Zero clearance wood-burning fireplaces, can be installed, almost anywhere in your home. Because they are designed to be placed almost directly against combustible materials, they can fit in much smaller openings. 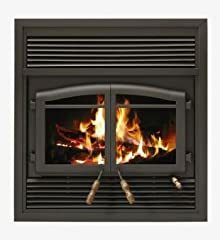 "FL-063 Flame Monaco EPA Zero Clearance Fireplace with Black Louvers"
"36" Louvered Wood Burning Fireplace w/Firebox- White Stacked panels"
The WRT/WCT3000 series wood burners have realistic warm red or white textured brick liners in stacked or herringbone patterns. The WRT/WCT3000 features hidden screen pockets, heavy duty log grate, easy access damper, outside air control, and are gas log ready. Includes: Insulated Firebox. Features: Heavy duty log grate. Adjustable outside air damper. Circulating rolled louver model. Durable textured powder coat finish. Fully insulated firebox (on select models) for increased performance in colder climates. Uses IHP 8 DM (1700 Deg.) double wall air cooled wood burning chimney. Uses IHP 8 HT (2100 Deg.) heavy gauge, double wall, air-cooled, wood burning chimney recommended for cold climates (required for Canada). 20 year limited warranty. Specifications: Overall Dimensions: 41" (W) x 20.5" (D) x 41.25" (H). Framing Dimensions: 41.75" (W) x 21.87" (D) x 41.75" (H). You will save money on installation. A zero-clearance fireplace does not require Massive Masonry work to protect combustible materials. "42" Radiant Wood Burning Fireplace- White Stacked Refractory Panels"
Though surprisingly economical, The WRT/WCT2000 fireplaces present a "big box" look with an oversized brick to brick opening. 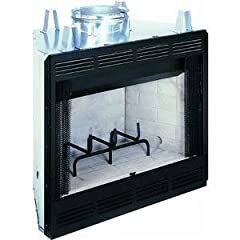 Available in clean-face and circulating models, the fireplace comes standard with textured, powder coat finish and full smooth white refractory brick liner. 8" pipe makes for easy installation. Includes: Mesh fire screen. Features: Log grate. Push/pull damper control. Radiant smooth-faced model. Barometric outside air damper. White stacked refractory panels. Durable textured powder coat finish. Fan kit available (for circulating models only). Uses IHP 8 DM (1700 Deg.) double wall air cooled wood burning chimney. 20 year limited warranty. Specifications: Overall Dimensions: 44" (W) x 21.13" (D) x 37.5" (H). Framing Dimensions: 44.25" (W) x 22" (D) x 37.63" (H). "Comfort Flame CWC42C Custom Wood Burning Fireplace, 42-Inch"
Comfort Flame's CWC42C 42" Custom Wood Burning Fireplace features a full brick liner and upgradeable louver panel. This fireplace is designed for use with an IHP, FMI, or Comfort Flame 8" wood burning chimney pipe and includes log grate and mesh screens. Pairs perfectly with 18" and 24" Comfort Flame gas logs.